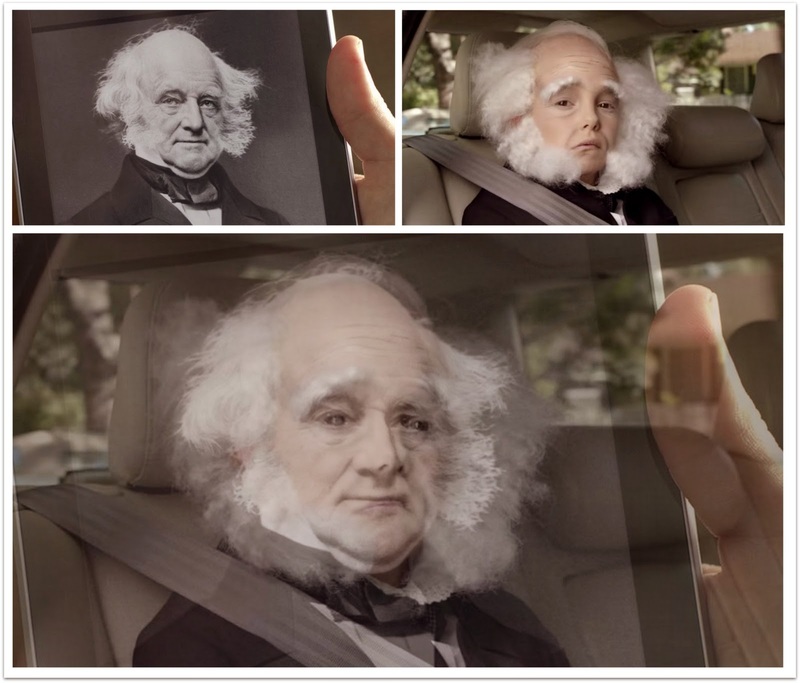 Which leads nicely to the spectacular case of the Martin Van Buren video. We know on 20 Nov 2012, Google uploaded the short video to YouTube. The 12,436,748 by YouTube standards are quite small. But the 103% Audience Retention certainly is not. We a 31 second average view duration (of a 30 sec video). That must mean some elements of that video has been watched more than 100%. Yesterday, I posted on a very complex video from Taylor Swift (with 153 clips). Thankfully today, there are just 22 clips. The shortest is 0.4 sec with the longest 5.68 secs. We have an average of 1.36 seconds per clip. As the lead slide on this post shows, there is little dialogue, which ends half way - with ambient sound and music to get us through to the end. 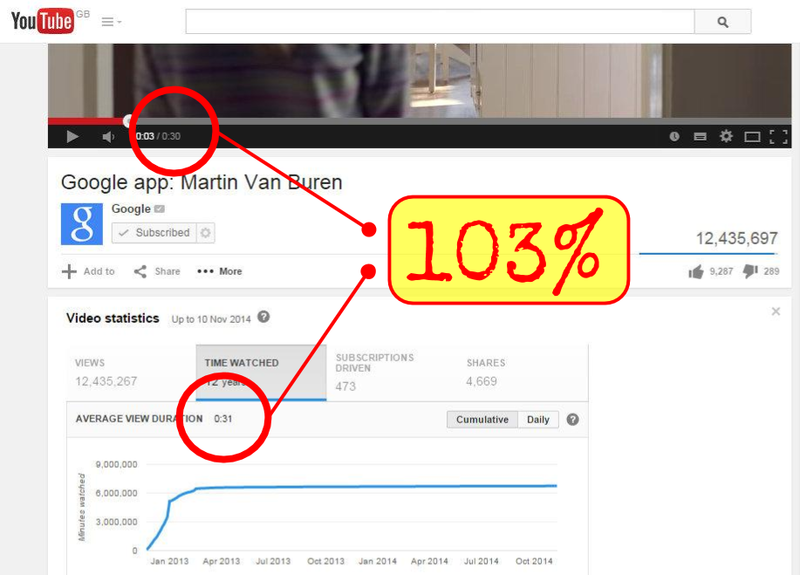 So why the 103% and why keep watching? Was there anything special we can learn from? I've charted the clips. We can see the now familiar rolling hills of a serpentine curve - down and up and down and up and down. 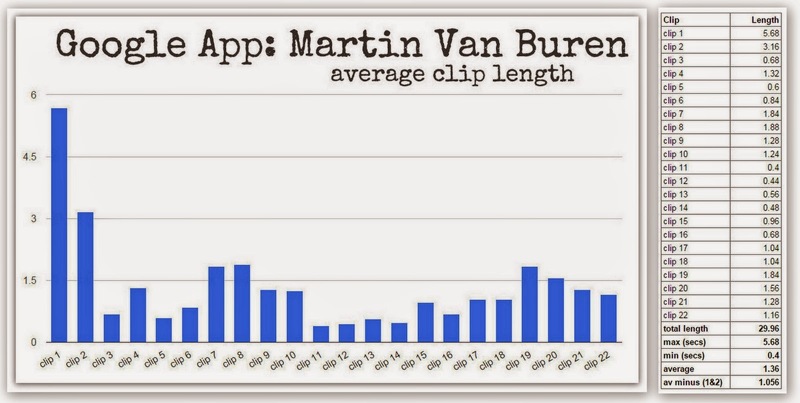 Clips 1 and 2 are very long (taking up 29% of the video length), And see how clips 11, 12, 13 and 14 are the shortest. They are when there is most action when the mother is gathering items from the house ready for the her creation. Once again, the camera never moves, as I said yesterday - this is no time to pan or zoom. At one second a clip - no time at all. That fact alone should give wannabe videographers hope. Anyone can make good videos - you just need a keen eye and patience. A mobile is just fine. There are two videos below. Play the original. Play the slide training edit. What do you notice? Can you follow with just the audio? Do the video clips add to the experience and keep you watching? Should there be more dialogue? Or should the clip be double in length? By looking very closely at the slide training edit, it may help you feel the timing of the slides. Remember they are very short at 0.40, 0.44, 0.56 and 0.56 - they create tension, urgency and conflict. What's impressive and enforces the piece, how we have the portrait Van Buren on the tablet perfectly aligned with the child Van Buren - at at 1.84 seconds seems like it's on screen for an eternity. This is kind of kinesthetic scaling (where we've had very short clips, and now a long clip). We get the sensation of slowness (the same could be felt when travelling fast in a car, then slowing, it then feels like we are at walking pace, when in reality the car may be travelling at 30mph. My point, videography can control time - it can speed it up, slow it down - skillfully, we can create anything we want. 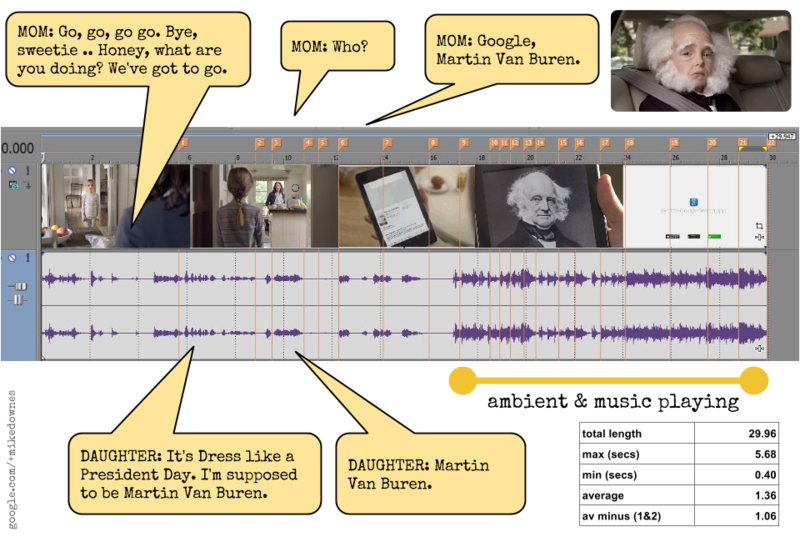 If the videography and director on the Van Buren piece were poets, they would have chosen the best 22 clips (maybe from over 200 clips). The same way a pro photographer may have 200 images and knows only one will make the gallery. And of course the writer plays with words. There are 36 words in this piece and thankfully, they had them in the right order.. The slide training video edit. This video replaces the video clips with two coloured slides.